A broken or fractured ankle can occur from a bad sprain and is a fracture to one of the bones in the ankle. Many fractures are caused by a severe impact, causing severe pain and rapid swelling. The ankle can be broken in several different ways and in different places so treatment to recover from this ankle injury is individual. Most ankle fractures are acute traumatic injuries caused by a severe ankle sprain or impact. Symptoms include sudden intense pain in the ankle with rapid swelling. Bruising is likely to appear over the next few hours. It will be virtually impossible to weight bear on the ankle with maximum pain located over the site of the fracture. An X-ray will confirm the diagnosis. 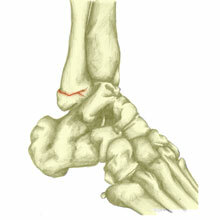 A Pott’s fracture is a fracture to one of the bony parts of the ankle called the malleoli. Fractures can occur to the lateral malleoli on the outside or the medial malleoli on the inside. It can be difficult to separate this ankle injury from a sprain, though feeling the ankle with the hands can sometimes indicate if it is a fracture or not. An x-ray can show for sure if it is a fracture. A Pott’s fracture occurs in the same way an ankle sprain might happen. Therefore it is often difficult to distinguish between a Pott’s fracture and an ankle sprain in the early stages of injury. Symptoms will typically include instant severe pain. The athlete will be unable to put weight on the leg and there will be tenderness at the point of fracture. There will be considerable swelling and bruising. What is a Pott’s fracture? A fracture to the lateral, medial or posterior malleoli or bony parts on the outside and inside of the ankle respectively is known as Pott’s fracture. It is often caused in the same way as an ankle sprain so can be difficult to tell apart initially. Lateral ankle sprains are more common and so fractures to the lateral malleoli also tend to occur more frequently. Initially, careful palpation or feeling of the malleolus and surrounding area can indicate that a fracture may or may not be present. Maximal tenderness on the bone may indicate a fracture, whereas if the area just forward or under the bone is more tender, this may indicate a ligament sprain. An x-ray is the only way to determine for definite if a fracture is present. Early x-rays may not clearly show this due to swelling and bleeding in the area and so if a fracture is suspected, then a second x-ray may be requested once the swelling has gone down. Depending on the severity of the injury surgery may be required to fix internal bones of the ankle which may have moved. Spiral fractures of the lateral malleolus and posterior malleolus do not usually require fixation and are treated without surgery using crutches and mobilization exercises early on. Lateral malleolar fractures with instability on the inside of the ankle and hairline medial malleolar fractures could become unstable and are usually treated with a plaster cast fitted below the knee for 6 weeks. Less severe fractures may be treated with an ankle brace or walking boot. A full strengthening and ankle rehabilitation program should be undertaken to include a wobble board or proprioception training. Fractures, where the bones have been displaced, may require surgery to reduce them or put them back in the correct position. A dislocated ankle is a severe injury which usually happens in conjunction with a fracture or complete rupture of the lateral ankle ligaments. A dislocated ankle can be a posterior, anterior or superior dislocation. They are relatively rare as all the ligaments on one side of the ankle have to rupture (normally on the outer side) and medical help is needed immediately. Symptoms of a dislocated ankle are usually pretty obvious with sudden intense pain and loss of normal function. There will be a visible deformity and the tibia and fibula bones in the lower leg may appear out of place. Any numbness or tingling in the foot would indicate possible nerve injury. If the foot is cold or goes a bluish white color then the blood supply is being restricted. Dislocated ankles are uncommon, and where they exist they are usually associated with a fracture. This is due to the strength and complexity of the ankle, which makes it very difficult to dislocate the joint. When it does occur, it is usually due to an indirect trauma forcing the ankle to flex abnormally. The ankle can dislocate in any direction and in any of those directions it is extremely painful. In order for the ankle joint to dislocate, all ligaments on one side must rupture. 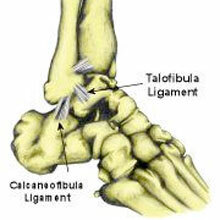 This most regularly happens on the outside of the ankle, where there are three ligaments. One or two of these are commonly injured during an ankle sprain. Initial first aid for a dislocated ankle is to apply the R.I.C.E principles of rest, ice, compression and elevation if possible until medical attention can be sought. An X-ray should be taken before attempting to reduce or manipulate the bones back into place because it is important to identify any associated fractures. After the X-ray has been analyzed, a medical professional will relocate the ankle. This could be done with manipulation but could also necessitate surgery. Surgery is usually required as a fracture is usually present. Plates and screws will be used to restore the position and stability of the ankle. After treatment, the ankle may be placed in a cast for several weeks, or the patient may be required to use crutches. Either way, activities that place force or weight on the ankle should be avoided in this period. Eventually, physical therapy can get underway to restore the normal motion of the ankle. Previously it has been recommended that the ankle is cast to immobilise the ankle and allow healing, however, this is no longer recommended as joint motion without loading has been found to promote cartilage healing.